The Heaton Park Golf Course is a picturesque Championship standard golf course, situated in the scenic grounds of Heaton Park. Designed by five times Open Champion J. H. Taylor it was opened to the public in 1911 and has been the host venue for many prestigious events, both professional and amateur eg 1983 PGA club Prof championship, 1984 ladies PGA tour event, Junior Nick Faldo Tournaments. The main course at the Golf Centre is a parkland course, boasting spectacular views over the Pennines and surrounding countryside and offers several imposing tee shots. Three lakes in the park, play a prominent part in every round, especially on the 193 yard 11th hole. Being a long par-3 and signature hole to the course, J. H. Taylor designed a challenge for all golfers across a deep water filled ravine, to a raised plateau green. Indeed, former Open Champion, Henry Cotton once described this hole as "the toughest par-3 in England". Peter Allis described the 15th hole as one of the most scenic holes he'd ever seen. Amongst many, famous players Bobby Jones and Walter Hagen. 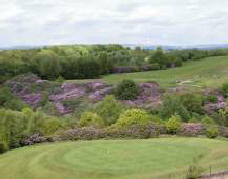 TO BOOK A TEE TIME PLEASE PHONE 0161 654 9899.